including notes on the objects. whatsinyourbag Originally uploaded by Joi. I saw this fun whatsinyourbag flickr tag on Minami's blog so I decided to dump the contents of my shoulder bag on the floor (at 5AM) and take a picture. How many power supplies do you carry with you on your trips for all those gadgets? Quite a few, right!? Oh that's a bunch of gadgets... Good stuff though and as a finn I appreciate the amount of Nokia phones! I'm not this bad, but certainly getting there. Had a great time at the US Embassy in Tokyo a few weeks ago. After handing over my cell phone, they asked me to remove all electric appliances from my shoulder bag to be held while I was in the Embassy. Assorted Cables, Batteries, and adapters. *note that the Archos Juke, the PSP, the Hard Drive, and the Video Player all use the same USB - 5v power cable. With a Power - USB adapter I have cut out over half my power bricks. When I was done I took my empty bag and one file folder to go an apply for extra passport pages. How much data are you transporting in that bag? I took this picture with my digital camera. I figure I usually travel with about 1 week (24hr x 7days) of Digital Video and about 1 month (24 x 30) or Digital Audio, About 200-300 Still photographs, Several maps, 6 or 7 dozen books in eBook format, 3-5 video games, and about 5-10 gb of various personal and work related data files. This is the portable version. My home fileserver storing my primary backup for all is over 400GB (out of 750GB Raid5 avail). So how much does all that weigh? I am in awe. All THAT fit into your bag?! And to think people look at me funny for cell phone, mp3 player x 2, palm pilot, and laptop (I live in a house of technophobes when not in Philly). 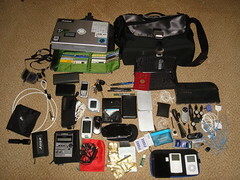 Listed below are links to blogs that reference this entry: whatsinyourbag. Joi Ito - "whatsinyourbag" by Joi Ito is licensed under a Creative Commons Attribution 4.0 International License.